IPL 2019: CSK makes it two out of two and has started their title defense in style. 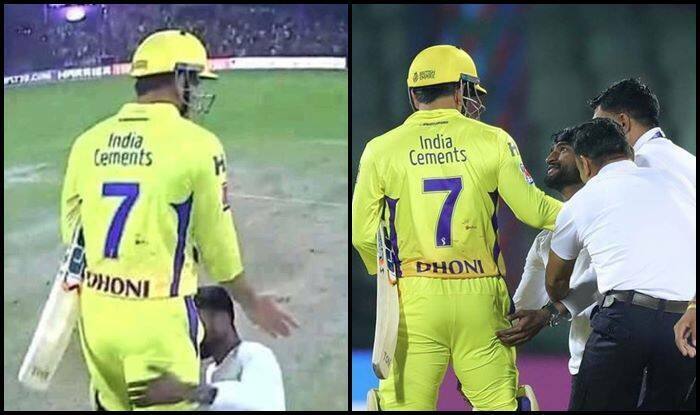 IPL 2019: Once again a fan breached security to touch MS Dhoni’s feet. This is not the first time a fan has done so, Dhoni is quite used to such adulation. The surprising bit was that it was a Delhi fan who touched Dhoni’s feet at Kotla. The fan entered the ground just after the Bravo hit the winning runs to take CSK over the line. CSK go top of the table with two back-to-back wins. Dhoni remained unbeaten on 32* as he played his role to perfection. Meanwhile, Dhawan made his homecoming special as he slammed his 33rd IPL fifty, whereas Bravo was the wrecker-in-chief at the back end of the Capitals innings as he scalped three wickets. “The wicket turned more than expected in the first innings. In the second innings there was enough dew. The bowlers did well to restrict them to 150. The batsmen we have like a bit of pace, and like it to come on to the bat. Losing Ngidi at the start was a big blow, because he was the quickest, but other than that we were well-covered in all the areas. I don’t think we will be a very good fielding side, but we will be a safe fielding side. You don’t want the XI to push too hard and get injured. We might bleed a few runs and make up for that with experience. We haven’t done well at the death, so plenty of areas to work on, but still a good victory,” said Dhoni at the post-match presentation.